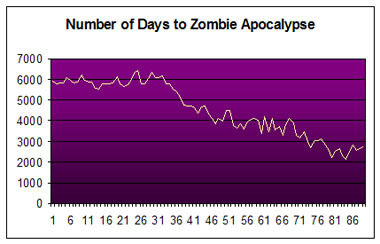 Zombie Apocalypse Prediction Date – Statistics | We Zombie! For an explanation of the formula, see the ZAPD explanation page. We’ve collected enough information on the dates calculated so far to run some statistics. The apocalypse is still extremely unlikely to happen in October or November. The most likely month for the zombie apocalypse is now December. The most likely day of the month for the zombie apocalypse is still the 26th. The most likely time of the day is still in the afternoon between noon and 6 P.M. The most likely day of the week is still Thursday. The Zombie Apocalypse is around 340 days away. 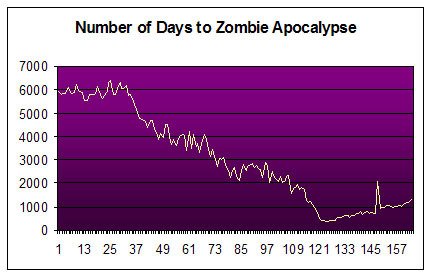 Signs of the zombie apocalypse have been stable recently, as shown in the graph below. The apocalypse is extremely unlikely to happen in October, or November or January. The most likely month for the zombie apocalypse is still July. The most likely time of the day is in the afternoon between noon and 6 P.M. The most likely day of the week is Thursday. The Zombie Apocalypse is around 1300 days away. The apocalypse is extremely unlikely to happen in September, October, or November. The most likely month for the zombie apocalypse is July. The most likely day of the month for the zombie apocalypse is the 26th. The most likely time of the day is in the morning between noon and 6 P.M. The Zombie Apocalypse is around 1500 days away. The apocalypse is extremely unlikely to happen in February or March. The most likely months for the zombie apocalypse are December and January. The most likely days of the month for the zombie apocalypse are the 23rd or 26th. The most likely time of the day is in the morning between 6am and noon. The apocalypse is extremely unlikely to happen in February, March, or April. The most likely month for the zombie apocalypse is the month of July. Tomorrow night for crying out laoud. Lauren. If you can shoot them in the head with it, you’re good if it happens. It’s a good thing you’re a perfect shot because if it happens it won’t be zombies like night of the living dead, it will be infected like RE. If it happens, anyone who isn’t a perfect shot will need either 20 tool sheds of ammo or explosives to survive. Oh, my! July 26th is my birthday!!! I don’t want that birthday gift… However, I will be ready, in fact I wrote a book about it!!!! Looking forward to reading your book – it’s on my list of books to purchase. What is your books name? John’s book is called “The Do-it-yourself Guide to Surviving the Zombie Apocalypse, by Bud Hanzel and John Olson”. I reviewed his book at http://wezombie.com/the-do-it-yourself-guide-to-surviving-the-zombie-apocalypse-book-review/. Mine is July 22nd so I feel you….I launched out of my seat when I kept seeing July as the most likely month.